In the previous article (see Teleological Temple), we reviewed the appointed week of Sukkot (i.e., Tabernacles from Tishri 15th- 21st ) as a prophetic similitude of God’s panoramic plan for the seven millennial days from Adam (see top week of the Moedim Paradigm). 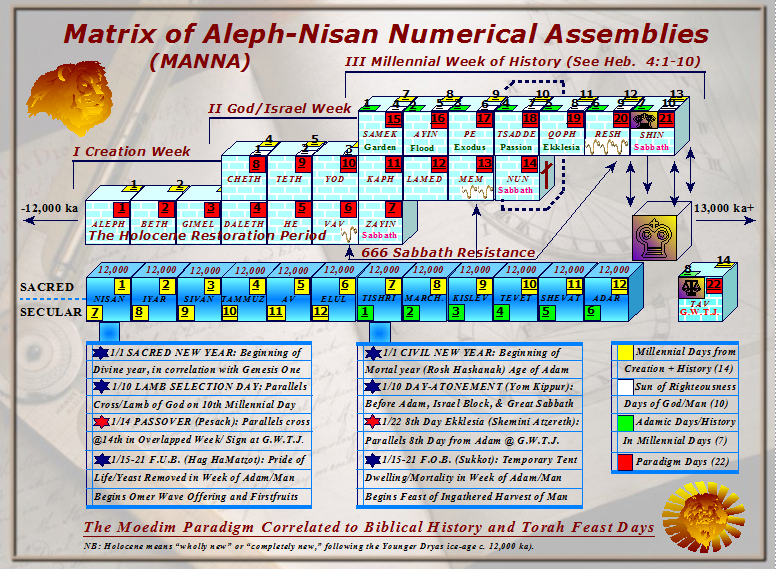 There, I explained- using some of Paul’s imagery- that we live in temporary tabernacles of mortal bodies until the Great Sabbath millennium is complete, and death is destroyed at the Great White Throne Judgment (foreshadowed by Shemini Atzereth [8th Day Assembly] on Tishri 22nd). Hence, the feast of dwelling in tabernacles/booths is really a spiritual look at God’s plan that includes salvation for the entire world, which is why it is also traditionally called “The Festival of Nations” (see Zech. 14:16-17). Like the Feast of Unleavened Bread, which is also from the 15th day through the 21st of Aviv (Nisan), Tabernacles was commanded to be kept on those days to witness to God’s seven-day, panoramic plan of judgement and redemption. 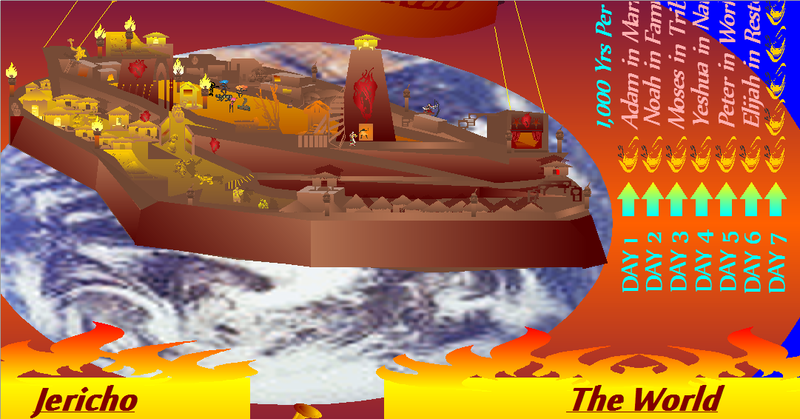 As previously written, national leaders will be required to keep the International Feast of Tabernacles during the millennium of Messiah, particularly because the moed (appointed time) will commemorate God’s gathering of the rest of His soul-harvest from seven millennial days, which is why Tabernacles is also prophetically called the Feast of Ingathering. Whereas the House of Judah (Jews who believe) are Firstfruits of the harvest, others from around the world will also be gathered into the commonwealth of Israel, restoring twelve tribes for the Great Sabbath Kingdom of Christ. Thus, Tabernacles is one of the Torah’s Three Pilgrimages (i.e., Shelosh Regalim: Sukkot, Pesach, and Shavuot) in which all of Israel was commanded to appear before YHVH at the Tabernacle or Temple. In this article we will look at the other side of the “Season of our Joy” and examine prophetic implications involving the annihilation of nations that seek to destroy Israel- a world that will be baptized in devastating trials and fire before the Kingdom of Heaven is manifest on Earth. To envision this, with all of its messianic truths, we will look back at the fall of ancient Jericho (c. 1450 B.C.) with Israel under Yehoshua’s command. When Sukkot was kept during Temple times, the kohanim (priests) would circle the Altar of Sacrifice one time for the first six of seven days, saying, “Anah HaShem [or YHVH] hoshiah nah” and “Anah HaShem [or YHVH] hatzlichah nah,” which is translated: “Please, God, bring us salvation. Please, God, bring us victory.” But early in the morning on the seventh day (a.k.a. Hoshanah Rabbah), the kohanim would circle the Altar of Sacrifice seven times, blowing the shofar (trumpet), mirroring Yoshua and the children of Israel’s defeat of Yericho. During this reenactment, the prophecies would be read (Haftarah) that look to the destruction of Israel’s national enemies at the end of the age (e.g., Zech. 14:12-15). Hence, Sukkot was not only an appointed time for joy and the Ingathering of a spiritual harvest of souls who support/join God’s work in Israel (cf. Deut. 16:13-15; Isa. 51:11), but it was also an appointed period of warning to the Gentile nations of an approaching global cataclysm: the Messianic Apocalypse. Just as the city of Jericho received warnings by the priests for seven days, God has been warning the world of an approaching time of great judgment since the days of Adam. At the close of seventh day of Sukkot, the priests poured water on the Altar of Sacrifice and its four corners, where fire had been, and this water libation (Nishuch HaMayim) marked a cleansing of salvation. According to the Temple Institute: “There, two kohanim would ascend the altar and pour the pure water and specially prepared wine through two silver spigots which would direct the water and wine down the side of the altar. This ceremony, done to bring good fortune and plenty to Israel…” In fulfillment of the shadow, water will spring-up from beneath the Temple region at the end of the Apocalypse, and it will flow to the Great Sea and the Salt Sea- a sign of God’s healing of the nations and Israel. But before that, the Lord’s two anointed witnesses will pour out Spiritual oil for the Menorah that enlightens the Temple of “living stones” and direct the flow of Waters of the Word, even as the two silver shofars (or trumpets) were utilized in the wilderness to bring the multitude (God’s army) to pick-up camp and follow the Lord. It was fitting for the Mashiach to come from Galilee, to show that God’s salvation would indeed circle the globe for all who believe and are willing to receive and obey the Spirit. 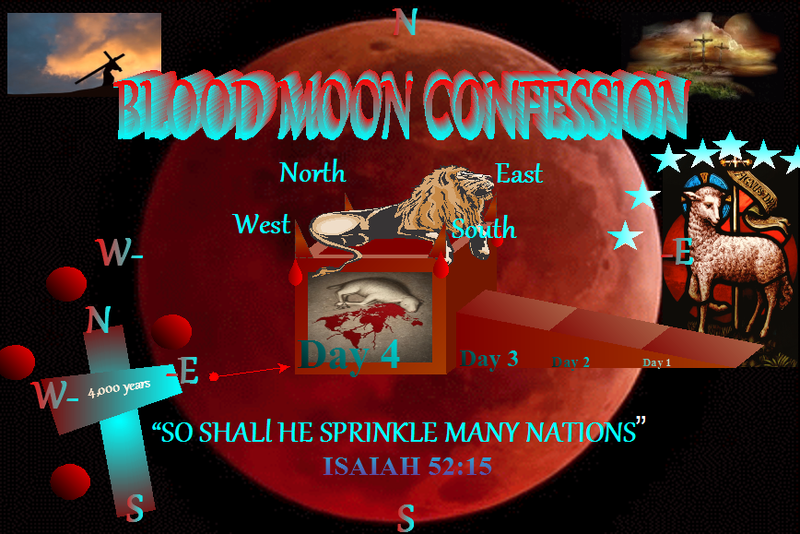 Thus, while the kohanim were circling the Altar of Sacrifice and its four symbolic horns, praying for victory, blessings, and national salvation, the Savior was saying that salvation would go out to the four corners of the world, for all who are called and believe in His sacrifice (see Isa. 52:15). As David prophesied before His ministry (see Ps. 26:6-8), Christ knew that circling the Altar is done with declaring God’s works to all who might hear them; doing so showed love for the Temple. In that same Spirit of openness and Truth, we will not speak of Zionism as some national mystery, novel invention, or conspiracy against the world; rather, we openly declare the works of God for all who will hear and see, plainly giving His warnings and the hope of joy and salvation to all- anyone willing to hear and see. Zion is Jerusalem, and the city will be exalted by God and praised by the world according to ancient Scriptures. After Christ explained that the “Son of man did not come to be ministered to, but to minister and give His life as a ransom for many,” he then went to Jericho to teach. And upon leaving, He met blind Bartimaeus, meaning son of honor, as he sat alongside the highway begging (see Mark 10:45-47, 52). When the man heard it was Yeshua of Nazareth (Jesus), he cried-out, exclaiming, “Yeshua ben David [Son of David], have pity on me.” What did Christ do? He told the son of Timaeus (the Honored) to go about his way because his faith had made him whole, whereupon Bartimaeus received his sight and followed Jesus in The Way. And this is the greater message that we seek to convey as we venture back to expound upon the destruction of ancient Jericho: that Christ has visited the world and still offers great spiritual insight (and healing of our sight) to all who will but cry-out like blind Bartimaeus. With Jericho symbolizing the world in traditional Judaism and some Christian teachings, we discern that the message of Christ’s visit is that there is still some time before the Sun of Righteousness dawns upon the seventh millennial day to purge nations that have rebelled against God’s works and will for Zion. Before we continue with the fall of Jericho and its wall that symbolized worldly lies, we should first set the stage with Israel coming out of the wilderness at the completion of a generation, which was a shadow of the 40 Jubilee Years (40 X 50 = 2,000) that must be complete before Yeshua brings in the Kingdom. Just as many Gentiles need their eyes opened to the coming Kingdom at Israel, many Jews still need better vision and comprehension of the biblical stories to discern the coming King Yeshua. A great multitude followed Christ out of Jericho, and many were Jewish Firstfruits of the faith, seeking greater understanding, and this indicates that many Jews will come around and escape the ways of the world for the truths of Yeshua haMashiach. 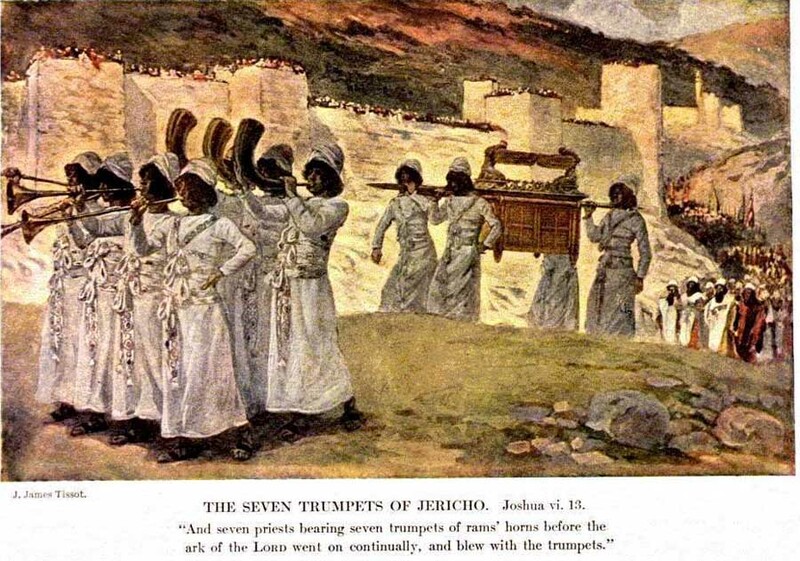 The Jericho conquest started when Joshua and the priests crossed the Jordan River, carrying the Ark of the Covenant, whereat they made the people follow 2,000 cubits behind so that all of them would have enough space to see Joshua when he and the priests entered the kingdom. This, of course, foreshadows 2,000 years, giving space/distance for all of the elect to discern the Lamb of God, with Yeshua as Yoshua. On that 10th day of Aviv (or Nisan), which was when Israel selected their Pesach lambs, Joshua had the Israelites camp in Gilgal, meaning rolling-away or whirlwind, some ten stades outside of Jericho. There they camped until the Paschal lambs were sacrificed on the 14th, and only thereafter did they begin the seven days of conquering Jericho. 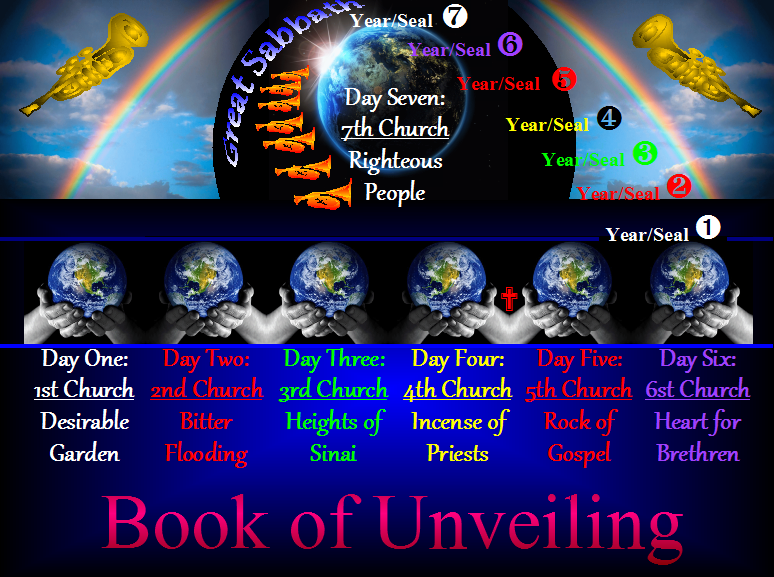 And what this means is that Christ came on the 14th day in the Moedim Paradigm, but the final week (15th- 21st) can not bring the elect multitude victory over the world without them first accepting the Lamb who was slain- spiritually speaking- before the world-age (our biblical history) began. Further, we must have a circumcision of heart and cut-away excessive flesh and enslavement to worldliness, and this is the message that was given to the chosen generation that awaited the fall of Jericho. After the Passover and renewal of the covenant, the land of Canaan became the Holy Land. The kingdoms of the Jericho-world became a foreshadowing of the Great Sabbath Kingdom of God. Indeed, a cryptic message came to the type of Christ: that entering therein and obeying God would be a return to the Sabbath Garden of Eden, from which the children of God (Adam and Eve) were expelled for disobedience. Like the garden, where at the entrance was placed a flaming sword of the Spirit to prevent trespassers, the new Holy Land was also guarded; only those who could pass the Sword of the Spirit could enter therein. The first thing I discern is that the Sword of the Spirit shows no partiality, but it turns upon any and all who seek to trespass against the Word and will of God. This was a message that only the Perfect One, who fully keeps the Word, can go in and out leading the sheep as He pleases, and for this, Yehoshua was merely a shadow of Yeshua. As another example, in ancient Hebrew custom, when a man died his widow would become the wife of his next to kin, often his brother, to raise up his tribal estate and sustain his family name; but if the man was unworthy or refused, the widow would loose his sandal off his feet as a witness, and thus she would go to the willing and worthy next of kin as her redeemer. As John the Baptist explained, he was not worthy to loose the Messiah’s sandal, for the Bride- meaning the holy citizenry– belongs to the Messiah (the Lamb who paid the dowry price). Joshua, like Moses before him, was reminded that only God manifest can fulfill the true role in the panoramic picture of redemption, with victory and salvation (cf. Ex. 3:5; Ruth 4:5-13; John 1:27; 3:28-36; 5:36; Isa. 43:8-14; 40:9-12; 61:1-3; Acts 1:5-6; Rev. 5:1-7). The former feast, again, expresses our mortality in the seven millennial days since Adam, and thus the Israelites dwelled in temporary booths. 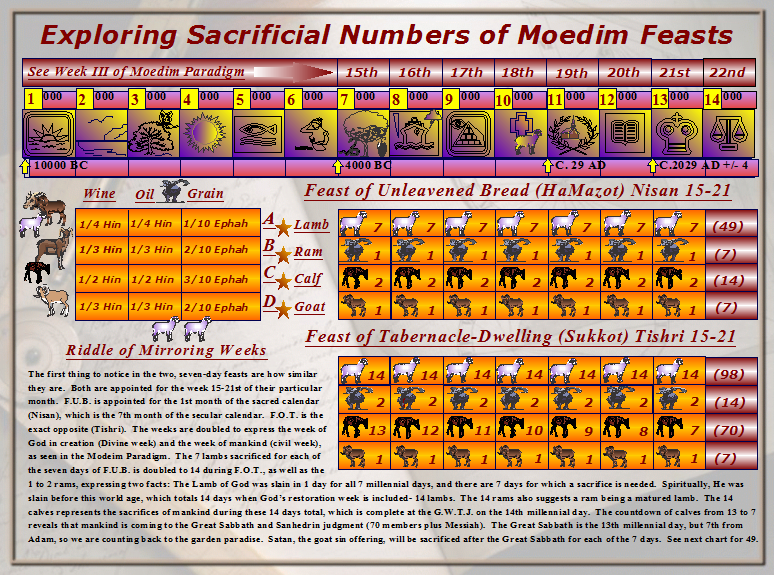 The first day (15th) of Feast of Tabernacles was mysteriously made into a Sabbath, as can be seen in the Moedim Paradigm, but for the seventh day of the feast there is no biblical mention of a Sabbath. This begs the question of what the absence of a Sabbath symbolizes in God’s greater prophetic plan. The clue we are given is that after the seven days there is a Great Sabbath on the 8th day (22nd of the month), which is the Eighth Day Assembly (Shemini Atzereth). If we understand that Israel represents the Firstfruits of God’s harvest (such as Christ’s apostles), and Gentile believers represent the Feast of Ingathering, we discern that not all who are gathered will have a part in the Great Sabbath of Christ. Indeed, many mortals will not live until the millennium is over, and then, on the 8th millennial day, 22nd in the paradigm, many of them will be judged worthy to enter God’s rest (i.e., at the G.W.T.J.). Hag HaMatzot, the Feast of Unleavened Bread, differs in that it represents all people who remove the leaven of sin- of false doctrines and pride– during the millennial week, 15th-21st. The seventh day of this feast is indeed a Sabbath. Pride of knowledge, after all, was what brought punishment to the serpent in the garden, and those who partook of Satan’s twisting of God’s Word were cast out of their Sabbath paradise (see Key of Knowledge article). After keeping the Passover, Joshua instructed the multitude to keep Hag HaMatzot in a way that is very revealing when studying the historical plight of humankind. Each of the seven days of the feast, the kohanim and soldiers were to march around the walls of Jericho, blowing their shofars as they went. This reveals that we have victory when we eat humbly of the Word (like unleavened bread, not exalted) as we face our enemies- bold towards them but meek before the Lord YHVH our Elohim. There is a Jewish tradition that claims that on the last day of Unleavened Bread, Israel crossed the Reed Sea, leaving their Egyptian pursuers in the overwhelming waters. This has brought many Jews to consider the last day of the moed as a sign of national deliverance. In Christian tradition, ancient Egypt is symbolic of our escape from a world of sin. Further, it is discernible that the waters of the Word that provide a narrow way of escape, being rightly divided, also bring death upon those who wish to keep the children of God enslaved to works of sin. In the Jericho fulfillment, however, we do not find the army of God fleeing pursuers, rather we find an army on the offensive and determined to bring down a wall of lies erected around the entire world, with the help of God and our leader the Messiah. As written, the gates of hades- the unseeing realm of spiritual darkness- shall not prevail against His called-out assembly when we have the keys to coming Kingdom. We invade the prisons of darkness and ignorance and take back all Divine things, as well as deliver all who will simply believe and become citizens of the Kingdom of Light. Moreover, in the similitude of the walls of Jericho, we have a depiction of God warning the world of coming judgments for six millennial days- the loud cries of our Ram’s horn of power. And on the morning of the seventh millennial day, the first year, the seven trumpets of Revelation will be blown (see Rev. 8:1). Then, just as Jericho fell, the kingdom of this world will become the Kingdom of our Lord. The world has been warned since the day of Adam. Note that this is a requirement of the “watchmen” and does not indicate that all believers will be held accountable for not warning others. And in Jericho we find that the following multitude was instructed to keep silent until the shofars were sounded for the seventh time- meaning seven years- on the seventh day. We might even postulate that Bible-believers oftentimes cause confusion rather than offering warnings, with contradicting revelation and eschatology. Too many have run without being called, and many who have been called have not run. And if those who are called to warn would rather live preaching peace with the worldly, those who are to be quiet have no choice but to warn. But whether God has called us, or people have appointed us, or we act as watchmen on our own merits, our warnings should be through the words of Christ- the voice of a great trumpet and deep waters (see Rev. 1:10). Jericho, according to some archaeologists, had been rebuilt several times over millennia, even before the Garden of Eden, and suggested in their finds are child sacrifices to Molech and other deities. 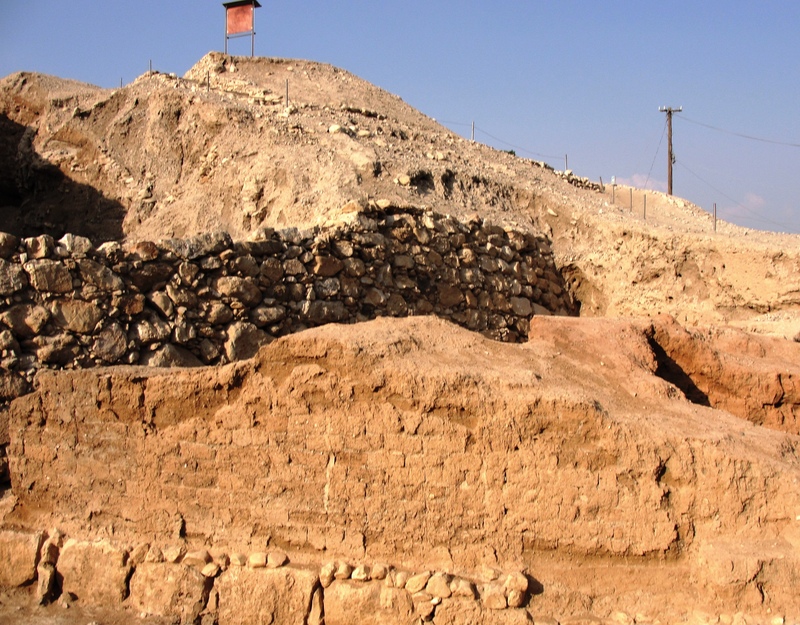 Infant bones, apparently woven throughout the remains of Jericho’s ancient walls, suggest that the sacrifices were meant to strengthen its mortar to better stand against enemies. Indeed, it takes more than a village to righteously raise a child, especially when a village or nation has become so morally corrupt and demented in a culture of death and abominations. It could be reasonably argued that the world is- in like manner- killing its children by hundreds of millions annually, provoking the wrath of God and our call for a new beginning. Whatever else Jericho’s walls symbolize- concerning the ideologies and practices of the world- is left to reader speculation. It could symbolize any worldview that seeks to resist the coming Kingdom of the LORD at Israel, be it the growing anti-Zionism movement in secular progressive universities or teachings of abject materialism (e.g., the so-called “Modern Synthesis”), brute communism or global socialism, Islamic radicalism or any other false religion. God knows. There are many forces that seek to prevent the coming Kingdom, and there are many ways in which people hide from the Truth and avoid the trumpet warnings of God. Leaven is cherished, and many people will not enter the Sabbath. Thus far, I, the scribe, have laid out the entire story of the Israelites leaving the wilderness and entering the Promised Land as a prophetic, historical parable that was orchestrated by God to foreshadow the panoramic picture of the elect entering the coming Kingdom of Heaven with Christ. 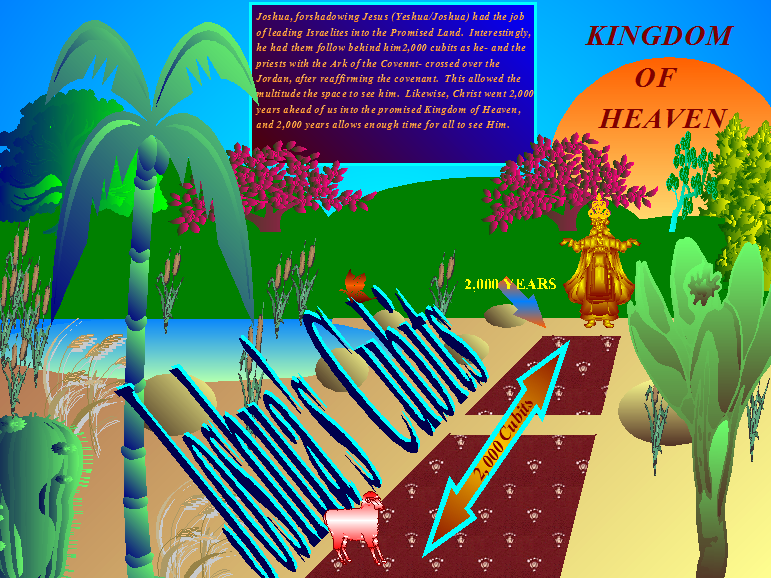 I explained how the tribes of Israel waiting 2,000 cubits behind Joshua and the priests was a prelude of God causing the elect inheritors of the Kingdom to wait 2,000 years after Christ went before us to prepare a place for us (i.e., since the cross), which was a distance in time that allows the Gospel of Christ to be preached to the faithful of the entire world, just as 2,000 cubits were enough distance for the millions of people following Joshua to see him. I then explained that the seven days of Joshua and the priests of Israel marching around Jericho, blowing the trumpets, correlates to the warnings of the Apocalypse and judgments on the nations that God has given for almost seven millennial days (since Adam and Eve). On the morning of the Great Sabbath, the first year, the seven trumpets of Revelation will be blown, just as seven trumpets of the kohanim were blown on the morning of the seventh day before Jericho was conquered and burned to ash. All the details of these things perfectly fit together to witness to the end of the age, and readers who truly know their Bibles and God’s mysterious means of communication via parables should know that it is all true. Now, we shall continue in our story with two spies who were hidden in Rahab the Harlot’s house. These two men, sent out by Yehoshua, are types of the “two witnesses” of Revelation, and the brave harlot’s house that they were hidden in symbolizes Jerusalem. 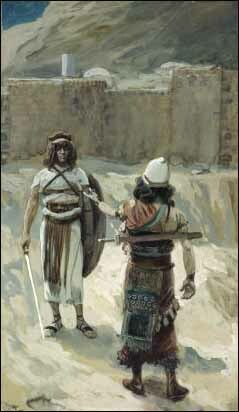 Jerusalem has not been faithful to God because of her many fornications with the world, but God will save the city nonetheless because of their faith in His Word, saved out of great tribulations just as Rahab was saved as the world (city) around her came crashing down with the walls of Jericho (cf. Isa. 40:1-6; Rev. 11:3-6). As we consider prophetic clues given about the two spies, we first find that they were sent specifically by Joshua, and this looks to the fact that the two witnesses will be sent by Messiah. Second, we notice that they were sent out from the groves of Shittim, meaning the sticks, which is likely a type of acacia wood/trees that yields aromatic gum; this correlates with the fact that the “two witnesses” are called “the two olive trees” and “two olive branches,” anointed to “stand by the Lord of the whole Earth.” (See Zech. 4:12-14; Rev. 11:4.) Like the two spies sent out, their names are hidden and not given within Scripture, although it is easy to discern that the very things that they will do unveil them as Moses and Elijah. Moses was first hidden from the Israelites’ enemies, the Egyptians, as an infant, and Prophet Elijah was hidden by lodging in a woman’s house as King Ahab and his servants searched for him. As for Rahab, her name, meaning large, is scripturally synonymous with the saved elect from Egypt, just as the city of Jerusalem is spiritually termed “Egypt” during the testimony of the two witnesses (see Rev. 11:8), when Prophet Elijah is commanded to “comfort My people” (see Isa. 40:1-2).